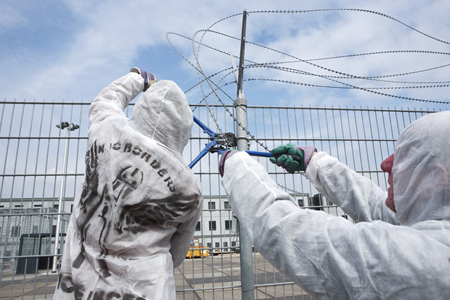 09.Apr.07 - Days before the official opening of the new detention boats in Zaandam, north of Amsterdam around 90 activists 'opened' the detention center by unexpectedly cutting down the fences surrounding the installation with bold cutters. The dutch ministry of justice plans to start using the new facility which provides 300 two-person cells for detention of 'illegal migrants' later this month. 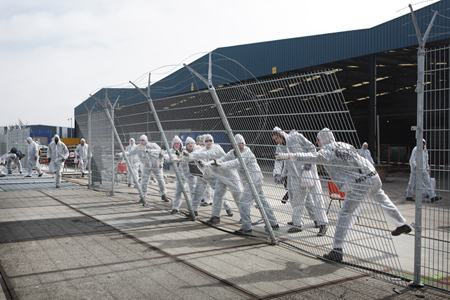 By dismantling more than 150 meters of security fencing the activists attempted to prevent or delay the opening of the new detention facility expressing their opposition to the repressive dutch migration policies and the disregard for the human rights of migrants that are imprisoned on a routine basis. One of the most severe means that can be used against citizens is brought in practice on these boats: deprivation of liberty. To justify this treatment in Dutch media and politics an image is provoked that links migration and criminality. The Netherlands put per 100.000 inhabitants more people in alien detention than any other European country. Most of the detainees are eventually not deported but end up on the streets again. After been caught after an inspection on the job or because of minor offenses like cycling on the pavement, people end up again in one of the many Dutch alien detention centers. A scare-off is the true goal of this migration policy and these new prison boats the means. The daily abuse on the Rotterdam prison boats, in use since 2004, has been exposed and is similarly expected in Zaandam: badly trained aggressive guards, lack of space and medical provision, and ongoing insecurity of the term of detention that makes it psychologically unbearable. 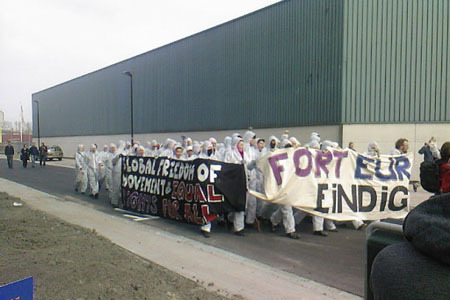 After the fences were successfully taken down the activists left as one group, holding a banner stating "For Global Freedom of Movement and Equal Rights for All". No one was arrested. The action took 30 minutes.